Whatever the non-Muslims do – there advancements in science, arts, literature or anything it absolutely doesn’t matter for the Muslims. The reason is that Islam has given the Muslims a higher place over the non-Muslims. So even if the Muslims remain backward & barbaric as they were in 7th century they will always feel that they are superior to non-Muslims. which means that even if non-Muslims are better human beings than Muslims -which they are- it doesn’t matter. What matter is whether you are a Muslim or non-Muslims. That’s all that matters. Q: How many Muslims does it take to change a light bulb? 3 to puzzle over the technology of a light bulb while wiggling their bottoms in the air 5 times a day, 3 to think more about it while wiggling their bottoms in the air 5 times a day, 3 to think really, really hard about how a light bulb works while wiggling their bottoms in the air 5 times a day, then 3 Muslims to decide that light bulbs are an evil infidel technology, four Muslims to destroy the light bulb, 2 to kill the people who sold the light bulb, 3 to kill everyone at the light bulb factory and three Muslims to blow themselves up when the ambulances come to tend the wounded. Finally, the 25th Muslim has to jump up and down screaming about how Islam is a religion of peace and tolerance. Gopal Godse, brother of Nathuram Godse , looks back in anger–and without regret. On Jan. 30, 1948, Mohandas Gandhi was shot dead by Nathuram Godse. Godse believed that the Mahatma, or great soul, was responsible for the 1947 partition of India and the creation of Pakistan. others were sentenced to life imprisonment for their part in the conspiracy. Gopal Godse remained in jail for 18 years and now, at 80, lives with his wife in a small apartment in Pune. He is still proud of his role in the murder. Although Godse is largely ignored in India and rarely talks to journalists, he agreed to speak with TIME Delhi correspondent Meenakshi Ganguly. These are the latest offerings fom the The Religion of Peace. The Holy Warriors of The Religion of Peace commited 145 Terrorists Attacks which left 766 people dead and 1190 people injured. To confirm an attack Google the date and place along with some description of attack and you will get the complete report. 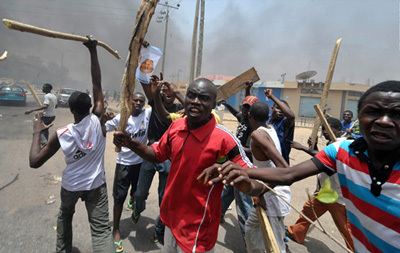 Why Muslims suffer in non-Muslim countries? This is an open letter to Ali Sina from an ex-Muslim. Here he has explained why Muslims can’t be good citizens, why they are not loyal to the country where they live and why they suffer in non-Muslims countries. 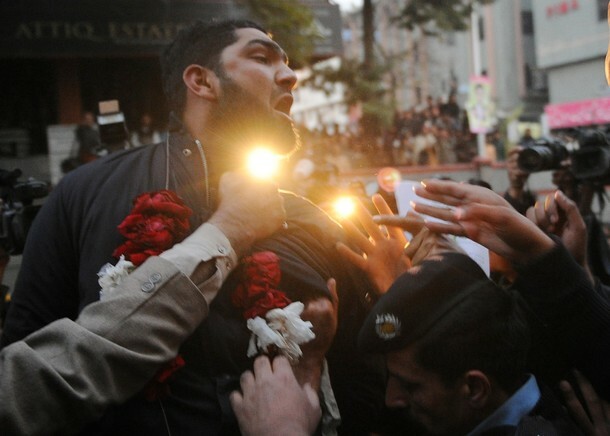 Here you can see the Mumtaz Qadri – the killer of Salmaan Taseer being showered with flower petals by his supporters.